Vietnam always supports and creates favorable conditions for Action Aid International’s operation in the country. Vice State President Nguyen Thi Doan made the pledge while receiving Joanna Derobah Kerr, General Director of Action Aid International in Hanoi on July 16. Doan thanked Action Aid International for its contribution to supporting sustainable development, hunger alleviation and poverty reduction as well as humanitarian activities in Vietnam, especially in disadvantaged areas in northwest and central regions. She also said she hoped that the organisation will continue to give support to Vietnam, especially in helping disadvantaged women, creating jobs and assisting vulnerable people, including women, children, disabled people and victims of Agent Orange. 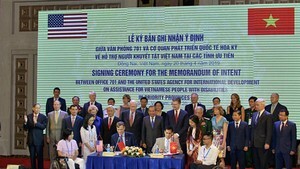 General Director Joanna Derobah Kerr spoke highly of Vietnam’s efforts in the poverty and hunger fight and the implementation of social development goals. Action Aid International will continue to implement its humanitarian activities in Vietnam in the future, she said.